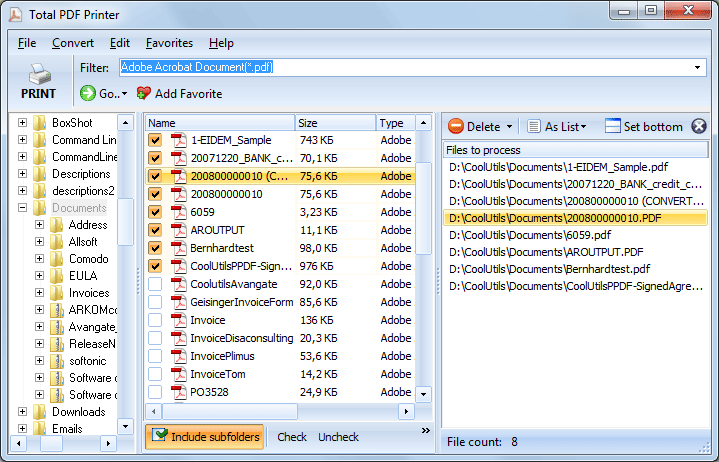 Total PDF Printer by CoolUtils is the most easy-to-use application to print PDF files in batches via command line. Sure enough one may open a PDF file by Adobe Acrobat and print it and when there are hundreds of PDF files to be printed it is the wrong way. Total PDF Printer can automate the process and save hours of time. You select paper orientation. Alternatively Total PDF Printer can auto rotate each file. This is a great feature if you have a lot of PDF files with different paper orientation. You select scaling of the files. You may choose a standard A4 or A5, A3, B4, B5, Legal, Letter, Tabloid. Again if you have many different PDF files Total PDF Printer offers fit-to-page option to automatically fit the file to paper. Printing a lot of PDF files is a great waste of ink. One may set the printing quality to High, Medium, Low, or Draft depending on the purpose. Separator is a handy option to separate the printed PDF files in the tray. Total PDF Printer may separate one PDF files from another with a blank page or a designated PDF document. Total PDF Printer prints PDF files in batches via command line. 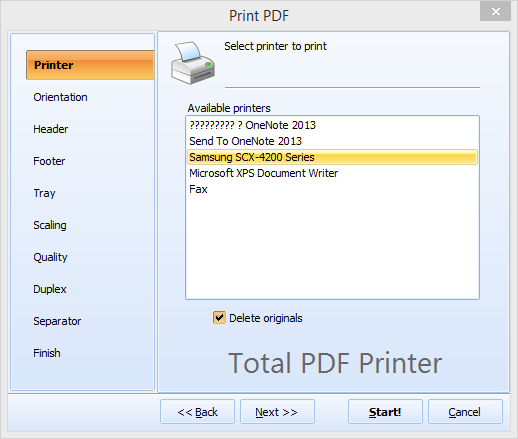 The server version called Total PDF PrinterX has no GUI and works silently on any web-server. As you see Total PDF Printer has all the options to print many PDF files at a time and involves as little manual work as possible. Get your copy now to automate PDF printing tasks. Once paid you get all the upgrades and prior tech support. 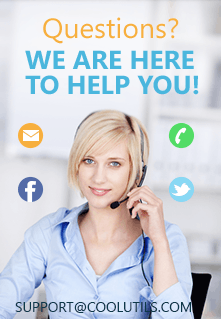 "Scanprint Logistics is a warehouse, where we store and distribute products for our customers. We are using Total PDF PrinterX together with Total Folder Monitor to automate printing of PDF-files from our customers and our ERP-system. Our customers upload PDF-files (EG. Invoices) to our FTP-server, and then TotalPDFprinterX prints them out, so we can include them with the goods we send out."